If Madame de Stael had died in 1799, she would be remembered, if remembered at all, as a curious period piece. Her efforts to force the revolutionary deluge into rational and utilitarian channels by means of her pamphlets, her lovers, her drawing-room conspiracies, were consequential enough to bring her to grief, futile enough to be ludicrous. Her writings, before 1800, despite flashes of brilliance, would not even have earned her a footnote in the history of French literature. To be remembered as a passionate heroine, she lacked in her love affairs an essential tragic dignity, simplicity, and honesty. But Madame de Stael lived until 1817, and few women left so deep an impression on their time. Later in the century, when liberalism became the established doctrine of the Western world, soon to degenerate into complacency, the significance of Madame de Stael became blurred; in our own times it is possible to see her again in the intense light of her relevancy. Nothing happened in her personal life in the year 1800 that would explain so sudden a transformation. In truth she was not transformed at all: nothing could change her except, in her last two or three years, physical disintegration. Like a spinning top, she derived her stability from her own inner movement, but every change of direction came from an impulse outside her. To stand still was death; what strength she had she owed to the activity which exhausted others. But before 1800 her activity had taken place amid constant flux: the top had been spinning on an ever-shifting plane. With each new impulse she had changed direction, opposed what she had helped to create, seemingly animated by the sole desire to undo whatever had been done. Her inner consistency could not become apparent unless the outer setting was stabilized; what she had learned in ten years of turmoil could not take on a consistent shape unless an unyielding outer force imposed consistency on her. As far as lay in his power, Napoleon Bonaparte did her this favor. It was he who happened to Germaine in 1800. He could not impose consistency on her heart, and her loves continued as turbulent as ever; but he did arrest the Revolution, and he stopped all outlets to ambition save one—to serve him, or his order, on his own terms. Per­haps Germaine was willing enough to serve him, but only on her terms. His uncompromising hostility met her intransigent resistance, and in the fourteen-year duel between the Emperor of Matter and the Em­press of Mind (as Sainte-Beuve called them), the Emperor ended up without any matter, while the Empress had broadened and sharpened her mind. Her struggle with Napoleon made her the Conscience of Europe; her equally relentless fight to dominate the men she loved made her its spectacle. Two wars of such magnitude conducted simultaneously should have left her little time for anything else; yet this was the period in which she wrote her epoch-making works—On Literature, Corinne, and Germany—besides others scarcely less important or voluminous. These works were her heaviest weapons in both her wars; through them she helped to found a new ideology; because of them she is remembered. The episodes of her wars must form the subject matter of her biography. The preceding chapters have dealt with the personal experiences that shaped and influenced her thought. The following chapters must, perforce, continue the narrative of events. It remains for this chapter to define the essence of Staelian thought and to place it in the framework of the forces that shaped it and of the forces it helped to shape. Germaine de Stael is invariably presented as the pioneer of Roman­ticism. Romanticism, in turn, is commonly regarded as a reaction against the Enlightenment. There is no question that Madame de Stael helped to spread German Romanticism, even if the importance of her role has been exaggerated; but her first visit to Germany took place only in 1803, and in all its essential features her thought was fully developed in 1800, when she published her book On Literature Con­sidered in Its Relationship to Social Institutions. She never departed from any of the fundamental principles she had laid down in that work. These principles, far from clashing with the philosophy of the Enlightenment, represented its ultimate conclusions and passed them down to later ages as the heritage of liberal idealism. If Romanticism was in conflict with that heritage, then Madame de Stael did not understand Romanticism. To look on Madame de Stael as a novelist and literary critic is to misunderstand her; she was, above all, a political thinker, a moralist, and a philosopher of history. Every work she wrote wrestles with the same ideas, and these ideas had little to do with literature, unless literature is understood in her own broad definition—"everything con­cerned with the exercise of thought in writing, excepting the physical sciences" (De la litterature, Preliminary Discourse). She was a pure product of intellectualism and rationalism. What­ever could not be rationally apprehended and expressed—music, for instance—was mere entertainment or, at best, a stimulation to reverie. In the eighteenth century, she declared, literature had "ceased to be a mere art; it had become a means to an end, a weapon in the service of the spirit of man." For a government to patronize literature "is to consider literary genius as separate from the social and from the political scene; is to treat it like the talent of music or of painting, or of any work which is not thought itself, that is to say, all of man." "The truly beautiful is that which makes man better." When Henry Crabb Robinson, a young Englishman, declared that she would never understand Goethe, she replied, "Sir, I understand everything that deserves to be understood; what I don't understand is nothing." Most baffling, perhaps, is her pronouncement on Mozart’s Don Giovanni: "Of all composers, Mozart probably has shown the greatest ingenuity in marrying music and words. . . . This witty alliance of musician and poet also gives a kind of pleasure—but a pleasure that originates in the mind, and this kind of pleasure does not belong to the marvelous sphere of the arts" (De L’Allemagne). 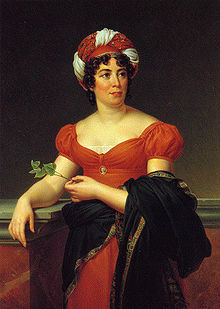 Madame de Stael approached literature not as "a mere art" but as a means to a moral or social end: to civilize mankind—to free it from ignorance, superstition, brutality, and injustice; to develop its innate sense of virtue by the cultivation of reason and sensibility, of enthusi­asm and the generous passions. This was, of course, the ideal of the Enlightenment, the intellectual and emotional climate in which Germaine had grown up. Germaine's cult of sensibility, of the passions, and of enthusiasm did not conflict in the least with the commonplaces of the Enlighten­ment. To ascribe this cult to the exclusive influence of Rousseau is a persistent error. It was Locke, not Rousseau, who first vindicated the just demands of the passions. It was Shaftesbury who argued, before Rousseau, that man had a natural sense of right and wrong and an innate sympathy for his fellows; who extolled the benevolent passions; and who wrote a Letter Concerning Enthusiasm that anticipated everything Madame de Stael said on the subject. It was Diderot, Shaftesbury's translator and commentator, who pleaded, even more eloquently than Rousseau, the case for the natural passions of man. Diderot was one of the familiars of Madame Necker’s drawing room; his collaborator, Raynal, whose immensely popular Philosophical His­tory of the Two Indies is a treasure house of anecdotes illustrating the noble passions among exotic savages, had earnestly conversed with Germaine almost from her infancy. Bcrnardin de Saint-Pierre had read his Paul et Virginie for the first time in Madame Necker's salon, though it is true that the audience fell asleep. Rousseau, then, was not in conflict with the "rationalists" over the necessity and beneficence of the passions. It was Rousseau, however, whom Madame de Stael singled out to acknowledge her intellectual debt, thus promoting the misconception about her spiritual affiliation. There was, in a sense, good reason for this. Rousseau, usually described as antirational and as inconsistent, was, paradoxically, the only one among the philosophes who achieved a synthesis of reason and feeling. This achievement was possible be­cause his temperament enabled him—indeed, forced him—to rebel against his age and to place himself outside society. Diderot, no matter how boldly he criticized his age and its institutions, needed society as much as food and air. It was not anything that Rousseau wrote which caused the break between the two men; what Diderot could neither forgive nor understand was that a man should cut himself loose from all social bonds. Rousseau frightened him: "I thought I saw a damned soul," he noted after their last interview. And a damned soul he was, for the clearer he made his position, the more he was bound to be mis­understood. There is no need to discuss the psychological reasons of the malaise Rousseau experienced in his contact with modern civilization. It is enough to say that he found it insincere, artificial, loveless, constricting, destructive of life. In order to live in accord with his impulses and reason Jean-Jacques broke with society, as Thoreau was to do after him. It should be noted that he wrote impulses and reason. There must be no conflict between natural impulse and reason, between conscience and law, be­tween individual freedom and social community: to reconcile these elements Rousseau wrote the Discourse on Inequality, The New Heloise, The Social Contract, and Emile. The result was a complete revaluation of all values. Laws, society, institutions, morality, such as they were, were neither lawful, nor social, nor orderly, nor moral, nor reasonable; in fact their purpose was the perpetuation of the very oppo­site, for they served only to cover up the pursuit of self-interest and power under the cloak of law and morality. Like all followers of Rousseau, Germaine took from him only what suited her. His break with the conventions of society suited her; his withdrawal from society itself did not. She could no more have lived unsociably than Diderot could. Rousseau's belief in the innate virtue of man, in the concord of natural feeling and reason, suited her too, but the radical Utopias of the Social Contract and of Emile did not: mankind must strive toward virtue by cultivating reason and sensibil­ity, not by remaking society from the bottom. Rousseau's rebellion against the frivolity of his time suited her, but his onslaught on the arts and on science did not. In every respect but one she accepted Rousseau when he was in obvious accord with the Enlightenment and rejected him when he seemed to deviate from it. The one exception is that Germaine, like most of her contemporaries, was profoundly af­fected by that new note of indefinable yearning, of cherished melan­choly, which Rousseau introduced into the literature of Europe. It was the image of a watered-down Rousseau that she shared with her age, not of the true Rousseau, Diderot's damned soul, in whose gigantic shadow the world still stands. For this sentimentalized image, Rousseau would have had nothing but a sneer—and his sneers were ferocious. Sensibility, passion, enthusiasm, exaltation, happiness, sadness— these words recur constantly in Madame de Stael’s writings, along with love, friendship, kindness, nobility, generosity, virtue; along, also, with reason, light, progress, freedom. All vague words, taken singly, but together they define her spiritual climate and contain all that was sacred to her. When, upon her marriage, she met the world with its mask off, she discovered that the world held all these notions in con­tempt. The shock lasted a lifetime. Contemptuous laughter at the expense of a generous, idealistic impulse or thought was, to her, the sin against the Holy Ghost. The "tyranny of ridicule," she explained in De la litterature, characterized the final years of the ancien regime in France and was the product of an aristocratic court society in which men were judged according to what they appeared to be rather than what they were. Every departure from accepted behavior was its target; "it laughs at all those who see the earnestness of life and who still believe in true feelings and in serious thought. ... It soils the hope of youth. Only shameless vice is above its reach." Before the Revolution this "discouraging mentality" was, at least, kept in check by a polished taste and the refinement of manners; the Revolution did away with the taste and the manners, leaving only the jeer of those who held money and power to be the one reality, and all the rest a dangerous and contemptible illusion. It is a singular tribute to Germaine's courage and toughness that, although this jeer wounded her in the depth of her soul, far from shunning it, she bravely provoked it every day of her life. Of enthusi­asm, the sacred spark, she made her religion, and the scoffers became, in turn, the objects of her scorn. In one of her earliest works of fiction, the short novel Adelaide et Theodore (first published in 1795), she caricatured the frivolity of the ancien regime in the figure of Baron d'Orville, "an amiable man, easy to live with, but so lacking in serious­ness that it would have been impossible to obtain his attention for a quarter of an hour even if the object was to save half his fortune. This disposition made him most amusing. In his youth, his insouciance was regarded as folly; in his old age, it was called philosophy: the effects were the same, only the name had changed." This representative of a society which had been destroyed because of its inability to devote fifteen minutes' thought to its own survival, reappears unchanged, twelve years later, in the Cornte d'Erfeuil, one of the characters in Corinne. Penniless and exiled by the Revolution, d'Erfeuil has lost nothing of his levity. Good-natured, doing good and evil indifferently, "capable of sharing pleasures and dangers but not griefs," d'Erfeuil is no better than those tepid souls in the antechamber of Dante's Inferno, on whose gruesome punishment Virgil comments, Non ragionam di lor, ma guarda e passa. It was to the emotional climate of Rousseau's ideas, rather than to the ideas themselves, that Germaine responded—the New Heloise rather than the Social Contract. And even in this respect she selected only what was congenial to her. Sensibility and enthusiasm, yes; un­defined yearnings for the unlimited, yes; melancholy, yes; love freed of the artificial shackles of society, yes, and again, yes. But all this was only Rousseau in the abstract. The real Rousseau was a brusque and loutish fellow who in order to escape human company would leave his house at sunrise with his dog, sneak around a corner, and wander into the fields, where he would lie down, daydreaming or merely ab­sorbing physical sensation—the smell of the grass and brush, the warmth of the sun, the colors, the sounds as they changed according to the hours of the day; it is difficult to visualize Madame de Stael doing this, and yet it was this which was the root of Rousseau's rebel­lion. As Ernst Cassirer has pointed out, Rousseau began his philoso­phy when he threw away his watch. This Rousseau Madame de Stael did not understand. She made a great deal of the correspondence between landscape and the state of the soul in Rousseau's writings; yet to the landscape of the New Heloise—the Lake of Geneva, the Alps—she preferred the gutter of the rue du Bac. In Corinne she succeeds admirably, it is true, in estab­lishing a correspondence of moods between characters and surround­ings, but only when the surrounding landscape is a city, Rome. This is no accident. Rousseau's landscapes have no history; Madame de Stael, when putting Corinne—herself—in a suitable setting, could not have chosen a better setting than Rome, which is not "a mere collec­tion of buildings, but the history of the world symbolized by various emblems and represented under various forms." "The most beautiful landscapes in the world," Germaine remarks elsewhere in Corinne, "if they evoke no memory, if they bear no trace of a remarkable event, are uninteresting compared to historic landscapes." Immediacy of feeling and experience, the goal of Rousseau's quest, was made impossible for Germaine by the interposition of the intellect. History was the very element of Madame de Stael, and she con­tributed mightily to making the nineteenth century the most historical-minded century to date. Aside from being in love, nothing intoxicated her more than being in history; and even love she viewed, like every­thing else, as a social historian. In this respect her mentors were not Rousseau but Voltaire and Montesquieu, especially Montesquieu. From them she learned that institutions, laws, mores, all manifestations of the human mind, were the products of man's environment, were related to one another, and went through historical phases: these— not wars, marriages, and successions—were the stuff of history. The sensibility, the melancholy, the yearning that appealed to Ger­maine in the New Heloise she also found in Werther, in Richardson, in the melancholy English poets—Gray, Young, Thompson—and in Macpherson's Ossian. In the classic literature of France, she found not a trace of it, except in two of Voltaire's tragedies, Zaire and Tancrede, the first inspired by Shakespeare, and both by medieval themes. Historic-minded, given to classification, and applying to sensibility and literature the principles Montesquieu had applied to laws and governments, Germaine formulated, even before her first contact with the German Romantic School, the theory that two con­trasting principles were at play: on the one side, clarity, sunlight, a happy, colorful, sensuous imagination, the southern, pagan, classical Mediterranean world; on the other, the misty, cloudy, melancholy, sensitive, Christian, northern world. How she tried to reconcile the numerous contradictions arising out of this dichotomy will, to some extent, be shown later. The important point here is that, by intellectualizing sensibility, Germaine established a relationship between his­tory and feeling, between social and political institutions and the human heart. This relationship occurred to her fairly early and, as it were, spon­taneously. It was in the air. Her father's tendency to subordinate all things, including the national budget, to a system of liberal Christian morality no doubt played its part in the process, as did his Anglo­mania. Her own origin, Swiss and Protestant, and her thorough knowledge of at least one foreign language and literature—those of England—saved her from the self-centered provincialism of the French, one of the most frequent targets of her wit. The novel notion that the French might learn from other nations, rather than serve as their model and cynosure, had been disseminated by Montesquieu and Voltaire; Madame de Stael by no means discovered it. But this notion, fairly popular just before the outbreak of the Revolution, had fallen into sudden oblivion. [i] Rousseau juge de Jean-Jacques, Third Dialogue. "It looks as if people, in the present state of society, had almost no use for the simple gift of life," Germaine echoes Rousseau in Corinne. Comments on "Madame De Stael: Ideology"